One of the age ratings of the Entertainment Software Ratings Board. This rating is aimed at people who are at least ten years old. This is why it is termed "Everyone 10+" or "Everyone Ten and Up". 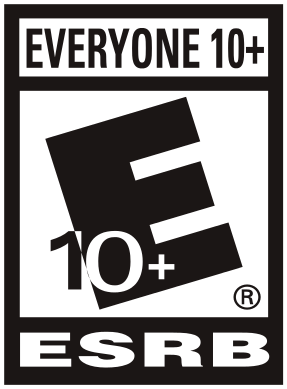 E10+ was introduced in 2005 as an in-between rating similar to the PG rating (in concept, anyway) thanks to Donkey Kong Jungle Beat, which contained a heavy amount of brutal fisticuffs and yet was still harmless in comparison to T-rated games. LittleBigPlanet PSP, for comic mischief and language. Pokémon Rumble series: Mild Cartoon Violencenote Until the game below was released, these were the only console games in their overall franchise to be given a rating higher than Everyone. Strider: Suggestive Themes, Fantasy Violence note This is for the first ESRB-rated release, which was on the Wii. Later ports carry the content descriptors of "Fantasy Violence, Mild Blood, Mild Language".